Sychnant Farm: Turn off the B2497 Llanedi Road and head east towards Sychnant Farm. Park on the farm yard and cross two steep fields down to river. Room for 3-4 cars. Tyn-y-cerrig car park: on the Garnswllt Road, near to the top boundary of PAA waters. Remember the combination lock (provided to all members) to gain access to the car park. Room for 3-4 cars. Ynys Llety car park: on the Garnswllt Road, near to the middle of PAA waters. 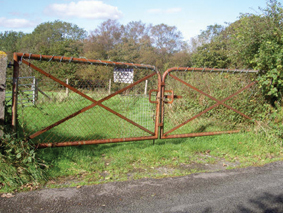 A very popular access to the river - a short, 5 minute walk across two fields and the railway line. Room for 3-4 cars. Tal-y-cwnlyn car park: turn left before the start of the Garnswllt Road (by humpback bridge), follow road for 300 yards, take first right into McMillans Ind. Estate. Continue through estate, cross the railway line and park on the left-hand side (by farm entrance). Room for 3-4 cars. Tal-y-fan-fawr car park: head through Tyn-y-bonau from Pontarddulais town centre (signposted Tyn-y-bonau Ind. Estate), pass 'DG Heath' Timer Merchants, continue over railway bridge, through the first farm house and onto Tal-y-fan-fawr farm. Park on left-hand side of the farm yard and cross two fields to river (oxbow). Room for 3-4 cars. 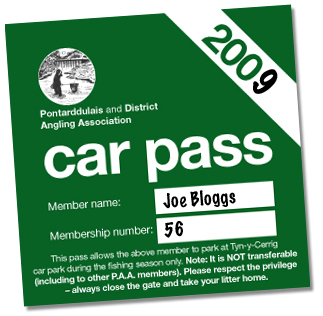 Always display your parking permit and carry your Environment Agency (EA) licence at all times. This free-phone number should be your first point of contact in the event of a pollution or poaching incident. Please ensure that you take the name of the assistant you speak with, and also ask for an ‘Incident Report Reference Number’ so that PAA have a point of reference to work with. It is also advised that the assistant you speak with is made aware that you will be reporting the issues to the PAA General Secretary – Lyn Davies. The Environment Agency will report back to the individual making the call. Please help us to protect the river by reporting pollution or poaching immediately they are discovered.